old-fashioned trunks revisited. The white spaces refer to the widths to explore with the mind as with the body. Very intriguing for couples, both young and for those who feel young in spirit. The Hotel Continentale is located in Florence, some steps away from the old bridge of the city Ponte Vecchio which offers one of the most romantic panorama of the river Arno. In the nearby, especially in the left bank, there is a world of handcrafted shops, evocative churches, medieval villages and all the ancient history of Florence. The Hotel Continental is 10 km far from the Amerigo Vespucci Hotel and 81 from Pisa. Created by the architect Michele Bönan, the Hotel Continentale is a striking design accommodation. Extremely stylish and modern, it recalled thanks to its furniture, colours and details the Italian fashion and films of the 1950’s. It is spread out on different floors with a lovely panoramic rooftop Sky lounge bar, perfect for a sumptuous and rich breakfast and an evening drink surrounded by a 360° fabulous view of Florence. The Hotel consists also of an upmarket shopping, a gym, relax and Spa floor and of the trendy Fusion Bar & Restaurant. Finally, it provides dedicated meeting rooms appointed with the latest technology. The 43 rooms and suites of the Hotel pay homage to the 1950’s. They are characterized by white colour and retro style pictures of Florence. 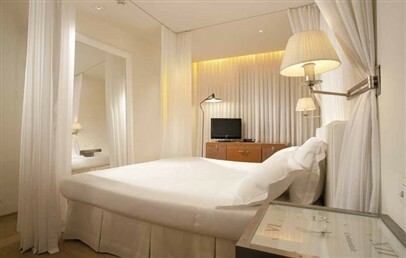 High quality services, free Wi-Fi and a Ferragamo complimentary toiletries are available in each room typology . The Hotel Continentale hosts the prestigious White Iris Beauty Spa by Daniela Steiner. The founder of the Care Suite method, her treatments and sweet philosophy guarantee the maximum relax and wellness. On request is possible to have the Spa services in the privacy of your room. The Fusion Bar & Restaurant offers a refined and International cuisine for lunches and dinners. The restaurant is trendy and warming, equipped in a minimalist style. The breakfast is served at the Sky Bar with the breathtaking view of the Florence. The Hotel Continentale have different meeting rooms and special locations ideal to organize special events, work cocktails and private parties. At guest disposal are also useful information about the best guide tours, yoga classes and bicycle excursions. Fascinating double room which pay homage to the 1950’s. 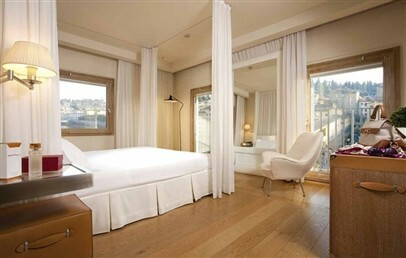 It is characterized by white colours, handmade leather works and by a curtain around the double bed as a intimate frame. 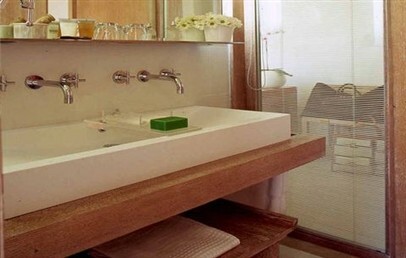 The elegant bathroom provides shower or tub and a complimentary toiletries by Ferragamo. Large, bright and fascinating double room characterized by Made in Italy design furniture and details. The double room presents curtains that wrap around the bed, an armchair and lamps of the 50’s, and a hand-made leather trunk turned into a desk. The elegant bathroom provides shower or tub and a complimentary toiletries by Ferragamo. The Arno Prestige face the Arno river and the Ponte Vecchio bridge. Large and beautiful double room characterized by white colour and retro style pictures of Florence, curtains that wrap around the bed and a hand-made leather trunk turned into a desk. The elegant bathroom provides shower or tub and a complimentary toiletries by Ferragamo. 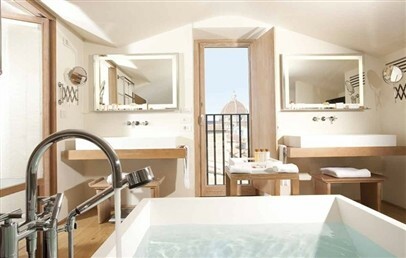 The Deluxe Arno room face the Ponte Vecchio bridge. Exclusive Suite spread developed on two floors. It is characterized by finest materials, delightful art, and chosen design pieces. The Suite consists of a bright double room and a large living room. 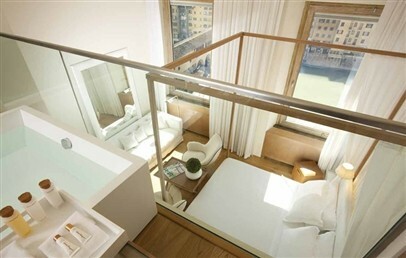 The elegant bathroom provides a king size bathtub and a complimentary toiletries by Ferragamo. The Penthouse Consorti faces the Brunelleschi Dome.